Biography and accomplishments or why Queen Tiye was famous: She was the chief wife of Amenhotep III and mother of the heretic Pharaoh Akhenaten, grandmother to Tutankhamun. Tiye was held in high esteem by her husband and she is depicted with Amenhotep III in statues, tomb and temple relief's. Shrines and temples were dedicated to her and she was worshipped as a deity in the form of the god Hathor. Queen Tiye held significant political influence at the royal court and after the death of her husband she acted as an advisor to her son. During the reign of Amenhotep III and Queen Tiye the priests of the Temple of Amun at Karnak gained wealth, power and political influence threatening the absolute power and authority of the pharaoh. Prince Tuthmose was the eldest son of Amenhotep III and Queen Tiye and heir to the throne of Egypt. Prince Tuthmose mysteriously disappeared leading to speculation that his story was the basis of fact behind the biblical character Moses. In the story of Moses he is portrayed as being brought up in the royal family but then he is cast out. 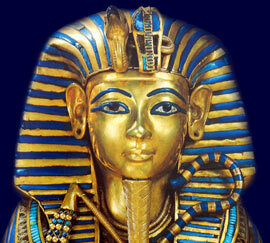 The name of this prince - Thutmose - is very similar to Moses. Could such a man have influenced his mother Queen Tiye and his brother Akhenaten to change Ancient Egypt from a polytheistic religion, with many gods, to monotheism (the worship of one god)? The radical change to monotheism by Akhenaten certainly curbed the power of the priests of Amun. Each section of this Ancient Egyptian website addresses all topics and provides interesting facts and information about the Golden Age of Pharaohs and of Queen Tiye. The Sitemap provides full details of all of the information and facts provided about the fascinating subject of the Ancient Egyptian Kings - their life, family, reign, dynasty, important dates and events and accomplishments.